Let’s begin by defining our terms. Negative rates in nominal terms means a bond investor (i.e., lender) pays $100 for a bond, with the promise to receive, for example, $99 (or any value less than $100) in return at maturity. In other words, you know in advance that you will get back less than you invest. In late 2014 in response to the soaring Swiss franc (which makes exports more expensive), the Swiss National Bank shifted to negative rates (currently at -0.75%). And this is one example of the implications for Swiss savers: “Alternative Bank Schweiz AG late last year became Switzerland’s first bank to comprehensively pass along negative rates to all its customers. Violating an almost religious precept in the financial world, ABS informed its clients that they would have to pay a charge of at least 0.125% to maintain their accounts at the bank starting in 2016, instead of the bank paying them interest.” Was the result a run on the bank? No. 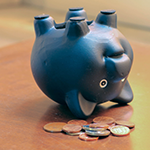 After the policy was implemented, the bank actually had a net gain of new accounts. German life insurers are in a bit of a pinch, to say the least, because the companies sold policies that promised what now look like high levels of guaranteed returns over long periods. Some insurers need to earn an investment yield of more than 5% to meet their guarantee obligations. That’s exceptionally difficult in an environment where the 10-year German government bond yields less than 0.1%, with the possibility that its nominal yield may turn negative as well. Stay tuned. And then there’s Japan, which is in a category of its own. 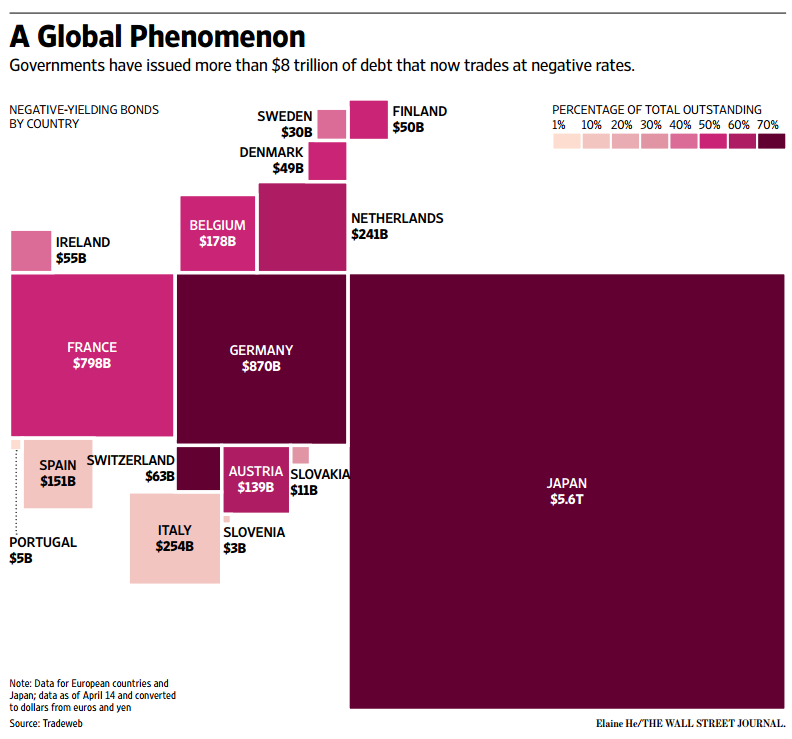 As the graphic above illustrates, Japan’s total of $5.6 trillion of negative-yielding bonds represents about 70% of the global total of $8 trillion of sovereign debt that trades at negative rates. In an attempt by policy makers to reflate their stagnant economies, the result is that about a quarter of government bonds in Europe and Japan now have nominal yields below zero. But let’s bring the story home to the U.S. Although the nominal yield of U.S. government bonds is still positive, by one measure the real yield, in which inflation is subtracted, fell below zero for the first time since 2012. With a recent 10-year Treasury yield of 1.75% (as of April 15, 2016) and the latest reading of the core Consumer Price Index of 2.3%, the real 10-year yield is -0.55%. The chart below illustrates the relationship between the nominal and inflation-adjusted yields in the U.S. over the last three and a half decades. Inflation is not an abstraction and is the main threat to bondholders. Real yields matter because they reflect the real purchasing power investors obtain from investing in fixed-income assets. 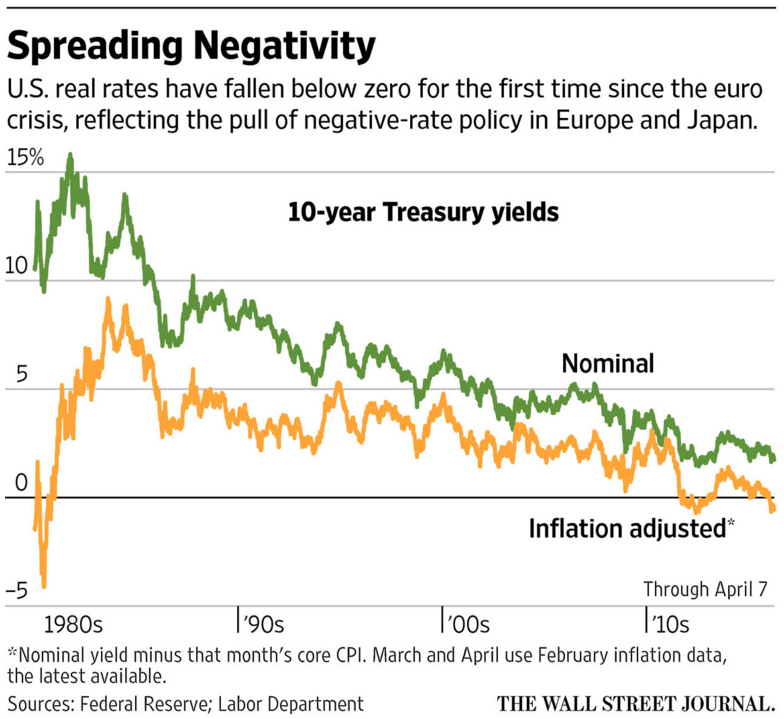 With yields so low, it doesn’t take much inflation to wipe out a bondholder’s purchasing power. Consider: At the historical inflation rate of 3%, a basket of goods that costs $1 today will cost $2.43 in 30 years. By stark contrast, equities, over any 20-year rolling period, have a peerless record of defending and accreting purchasing power through increasing dividend income as well as long-term capital appreciation. The bear argument against stocks is that earnings are punk and therefore stocks are overvalued. With the drag from the oil sector, the Q4 2015 combined earnings (reported earnings per share, which includes non-recurring revenues and expenses) for the companies in the S&P 500 were $18.70—the lowest quarterly total since Q1 2010. Based on “as reported earnings” estimates from Birinyi Associates, Inc., the S&P 500 trades at a price-to-earnings ratio of 18.5x, compared to a long-term historical average of about 15.5x earnings. Even at a higher P/E ratio of say 20x, the earnings yield would still be 5%—and multiples higher than bond yields. Most importantly, this type of analysis based on historic P/Es in a vacuum ignores inflation and interest rates as determinants of the relative value of future earnings—in other words, it’s a one-variable equation. Counting only the dividend yield of 2.2%, stocks still yield 45 basis points more than the 1.75% available from the 10-year Treasury (to say nothing of the earnings growth, dividend growth and the potential for capital appreciation available from equities). So in the upside down world of negative rates, with a promise to get less than 100 cents back on your invested dollar, pick your poison.